Lasik surgery is very popular now-a-days. It helps you get rid of several eye problems. The operation aka situ keratomileusis, uses a laser to work its way underneath the flap of the cornea to help reshape the cornea itself. If done in a proper way lasik eye surgery can be beneficial to cure certain vision difficulties. While in most of the cases, lasik surgery yields desired results, there are some failures too. So, before going for a lasik surgery you must be aware of some dangers associated with it. Here I am discussing about some common pitfalls of Lasik surgery. According to Food and Drug Administration website, fda.gov laser eye surgery may cause loss of vision. In some cases this loss of vision cant be overcome even by the use of glasses, contact lenses or further surgery. Another risk factor of laser eye surgery identified by the FDA is permanently dry eyes. The reason behind is that after the surgery the patients cannot produce enough tears. This may be cured by frequent use of eye drops or in some cases, use of punctal eye plugs. After laser surgery not every patient is supposed to achieve 20/20 vision in each eye, according to reports found in the Eye Surgery Education Council’s website. While the majority of people see instant results after only just one procedure there are others who are forced to do two in order to fix the trouble and see any effects. This second operation will be used to focalize the vision and is basically for the people with truly intensive prescriptions. You may still need glasses to bring your vision to 20/20 after you are done with lasic surgery. Unless you have one eye corrected for farsightedness and another eye corrected for nearsightedness (a condition called monovision), you will need reading glasses after the surgery as you needed before the surgery. Though this is very rare case, but not uncommon. There are people who have suffered from vision problems after several years since the surgery was performed. This is common for aged people who are losing vision due to old age. another Lasik eye surgery is recommended for them. Visual aberrations are specific visual effects that can come about during the lessening of visual quality and LASIK surgery. The trouble one faces with this include the difference in the refractive power between both eyes, aniseikonia, the difference in the size of the image that is between both eyes, hazy vision, double vision, and the fluctuation of vision during the day time. According to the Canadian government’s Health Canada website, hc-sc.gc.ca, corneal estasia is another dangerous complication of laser eye surgery. If the patient has too thin corneal tissue, cutting it may weaken the cornea, causing it to bulge from the surface of the eyeball. In this cases, a corneal transplantation may be required. 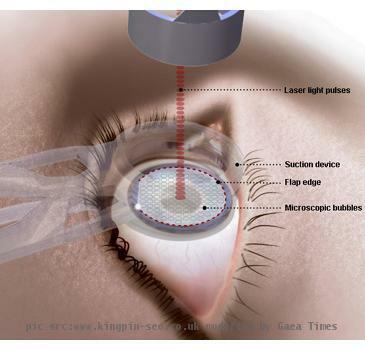 Lasik surgery poses another two dangers — Inflammation and infection. After surgery your doctor will prescribe you to take steroids to control inflammation. Whereas, antibiotic eye drops will help you prevent infection. You should be careful about its use. use eye drops exactly as prescribed for a period of days or weeks. During LASIK laser eye surgery, a hinged flap is cut into the surface of the eyeball. According to the FDA, one danger during surgery is that the flap can be completely cut off and the surgery must be stopped without achieving correction. Depending on the damage and how the flap heals, further surgery may not be possible. Some patients have reported about weak night vision after they went through laser eye surgery. They see increased glare or halos around bright objects at night. Read more about Lasik surgery here. Thanks for this great article that outlines all of the dangers. While these are true, I think it’s also important to get a doctor that you really enjoy and trust. I looked at about 5 different doctors before making my decision. If you’re comfortable with them, you’ll be much more likely to trust them. I am a blogger within the Laser Eye Surgery industry. I am wondering whether i can send you some original professionally written posts for your website.